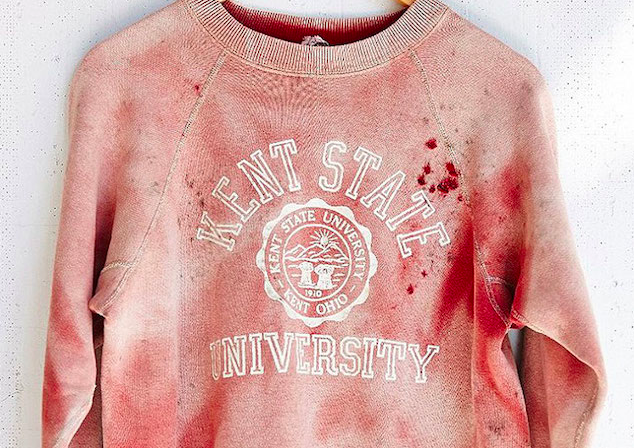 Urban Outfitters Kent State sweatshirt: Fake-blood-covered item is "sold out." This weekend Urban Outfitters briefly made a “Vintage Kent State Sweatshirt” splattered with fake blood available on its website for $130; it’s now listed as “Sold Out.” The joke is that in 1970 four Kent State students were shot to death by National Guard soldiers while protesting the Vietnam War. In 2010 Urban Outfitters sold a T-shirt that displayed the message “Eat Less.” The joke is that some people starve themselves because they believe obsessively that they are overweight. In 2004 Urban Outfitters sold a “Jewish Girls” T-shirt covered in dollar signs. The joke is that Jewish people are obsessed with money. In 2003 Urban Outfitters sold a board game called “Ghettopoly,” which included a card rewarding players for the achievement of “you got yo whole neighborhood addicted to crack.” The joke is that poor people are drug addicts and drug dealers. In 20[insert future dates here], Urban Outfitters will sell [item names] emblazoned with [image/text] referring to [historic tragedy and/or demeaning stereotype]. While it is true that [historic tragedy and/or demeaning stereotype] is a subject that could be referred to or perhaps even joked about in a different context without causing offense, it is difficult to see [item name] as anything other than a smug insult to [relatively powerless group] given that it is only the latest in a long line of similarly belittling products manufactured by a corporation controlled almost exclusively by [names of white males].